The residence of gold miner, Theodore “Totie” Adams where he committed suicide after attempting to shoot dead his wife, Sarojnie Warnauth. An elderly gold miner attempted to kill his wife and shot himself dead afterwards at their Bourda, Georgetown residence, police said. Dead is 73-year old Theodore “Totie” Adams. His wife, 43-year old Sarojnie Warnauth was admitted to a private city hospital where doctors were performing emergency surgery. 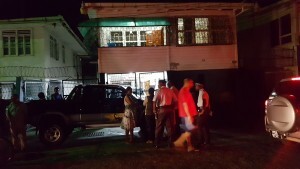 ‘A’ Division Commander, Assistant Commissioner Clifton Hicken told reporters that neighbours heard a loud explosion at the couple’s home located at 24 North Road, a few doors east of Baroombar, at about 7:30 PM. Police were summoned and Adams lifeless body, with a gunshot to his head, was found while his wife was rushed to a city hospital with a gunshot wound to her mouth. Sources said that in recent years Adams was mentally unstable. Crime sleuths have since learned that Adams and his wife had an argument over a 10 year old girl that he claimed was not his child. A licensed handgun was found at the scene of the crime. Detectives were up to late Wednesday night interviewing persons at the house.